Located in the heart of Gilbert, this spacious home offers to seniors a level of distinction in assisted living during their retirement years. This custom designed home includes five private/semi private bedrooms, grand common areas, beautiful views, and peaceful patio areas overlooking the sparkling pool. 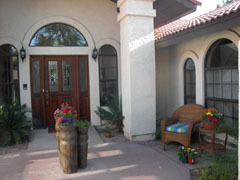 KopperCrest Manor invites you to come and visit our beautiful home intersecting Baseline & Lindsey in Gilbert. We offer a comfortable lifestyle with around the clock licensed staff, dedicated to your personal needs. Our meals are prepared fresh daily with your special requests or health requirements in mind. A new and diverse menu is created weekly for our resident's enjoyment. Family recipes and suggestions are always appreciated. Visitors meals can gladly be prepared with advanced notice. We welcome you into our home with open arms. We're very proud of the friendship and care we provide to our residents. Once you see our home we know you and your family will be proud to call it your own. KopperCrest Manor's Assisted Living Program facilitates clear and concise Medication Policy and Procedures and guarantees compliance with all Arizona Department of Health Services regulations and statutes. Medication Administration is provided per each resident's specific needs. Upon admission, each resident's specific Medication Administration Program will be developed and implemented by the Facility Manager with input from our nurse, resident's physician, and family. Our activity schedule is developed around our residents' needs and wishes. A Resident Activity Committee helps to develop the weekly schedule and the staff is involved directly and indirectly to encourage participation. The activity schedule is diverse and includes arts and crafts, games, group exercise and movie nights, bingo, cards, gardening, and much more. Group and individual activities provide an active, happy atmosphere for residents and staff.